Escape to an adventurous getaway in your own backyard. Create a charming and functional space by adding this gorgeous, soft-top gazebo by Sunjoy. This gazebo is a perfect choice when you want to beat the summer heat and enjoy your time outdoors. It will turn a bland backyard patio or pool area into an inviting place to read a book in solitude, or entertain. It will soon become the favorite outdoor, shady hangout for your family and friends. They will love its versatile, unassuming design that will easily coordinate with your outdoor dicor. This gazebo comes with style in mind; a beautiful pattern decorates the valance, a design which is mirrored beneath the cupola. You will get protection from harmful effects of the elements for seasons to come. Your Sunjoy gazebo comes fully equipped with everything you need. You will appreciate escaping to the shady sanctuary in your own backyard, patio or pool area. It is time to entertain in style. Get ready to make your outdoor patio as cosy as your indoor living room with this product. This all year-round shelter is crafted to be the idyllic extension of one's indoor comforts, allowing you to enjoy that outdoor breeze whilst being protected from the elements. Built from durable aluminium and powder coated, this rust-resistant gazebo can withstand the toughest of weather conditions and protect you from those pesky bugs with its mosquito netting. Whether you use the blinds to get a little bit of extra privacy, jazz up the gazebo for parties or some creative space, this gazebo is the perfect companion to meet all your outdoor needs. This beautiful Cardiff Gazebo is designed with the most discerning of customers in mind. It features a simple square-patterned railing and a pointed, two-toned valance with tan piping on light brown fabric that adds to its refined look. Full netting helps keep the bugs out, while built-in hooks provide a convenient place to put hanging lights. Beautify your yard with the addition of this Jackson Hard Top Gazebo. It offers dual-tiered roof construction, and the upper cupola is made from plastic composite to allow soft light to filter through. Its large frame is big enough to comfortably set up an ideal dining area or lounging zone for the whole family. Soft Top Outdoor Gazebo Escape to an adventurous getaway in your own backyard. Create a charming and functional space by adding this gorgeous, soft-top gazebo by Sunjoy. This gazebo is a perfect choice when you want to beat the summer heat and enjoy your time outdoors. It will turn a bland backyard patio or pool area into an inviting place to read a book in solitude, or entertain. It will soon become the favorite outdoor, shady hangout for your family and friends. They will love its versatile, unassuming design that will easily coordinate with your outdoor dicor. This gazebo comes with style in mind; a beautiful pattern decorates the valance, a design which is mirrored beneath the cupola. You will get protection from harmful effects of the elements for seasons to come. Your Sunjoy gazebo comes fully equipped with everything you need. You will appreciate escaping to the shady sanctuary in your own backyard, patio or pool area. It is time to entertain in style. 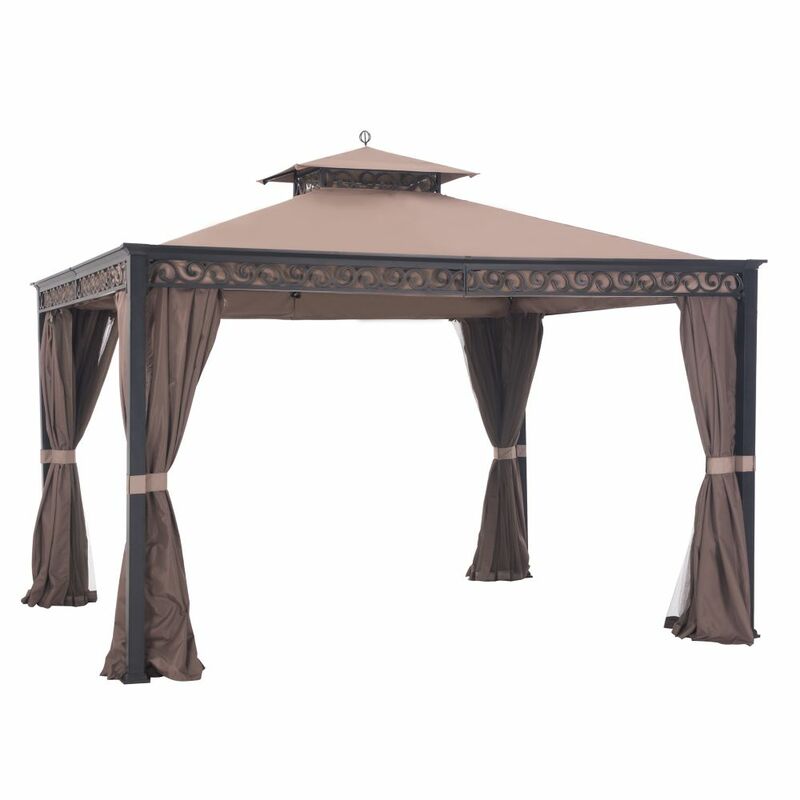 Soft Top Outdoor Gazebo is rated 1.0 out of 5 by 2. Rated 1 out of 5 by FlowerGirl from Pretty Gazebo, But Very Poor Quality This gazebo has a nice look, however it is not what I expected for the price. The curly embellishments which are intended to look like wrought iron are stamped sheets of metal that literally are paper thin adding no strength to the structure at all. They are for show only and bend easily when touched with one finger. I bought this online thinking this would be a very strong and durable gazebo considering the price. It is just as flimsy and cheaply made as the much lesser priced models. The box arrived very torn in multiple places and the posts were all scratched. The metal supports for the ceiling area are also so very thin and substandard. I have yet to put the canopy on because I am trying to reinforce the cheap structure so it hopefully will stay up for at least one season in WI. Next time around I will go to a fabrication shop and have one built out of real American steel not the folded super thin garbage this is.